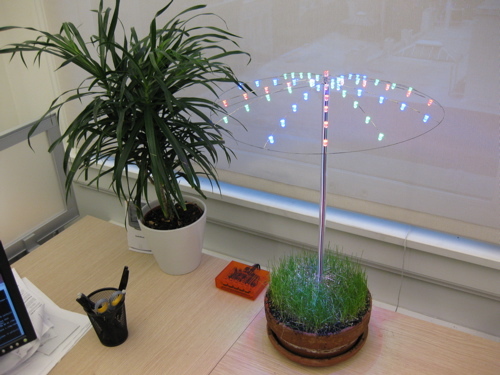 Ever wanted to grow grass in your cubicle? I did. But the grass kept dying. So I made a custom grow light out of LEDs, and now I have the nicest lawn on my block. Build photos, schematic, sourcecode, etc. are on the project page. OMG I want one!!!! It really works!!! You don’t need a green led for plant growing. Green light doesn’t participate in photosynthesis. The green LEDs give the light a more natural color. Before building my own light, I tried a commercial LED grow light which was mostly red with a little bit of blue. It worked very well, but the grass looked terrible. At one point I considered adding a feature that shuts down the green and blue channels at night to save energy. But now that it’s all built and the grass is growing, I’ll probably never get around to adding it. I’m wondering now what would happen if you put the leds just above the dirt, pointing up. Gravity vs. phototropism: FIGHT! Wow….. the LED umbrella is really looking just awesome. And this one is really the great invention for the mankind. Because of this one really cuts our light bills. And the LED lights have really the longer life span. And this one is really the incredible thing for the indoor gardening. It’s really looking fabulous. Thanks for sharing some authentic thing.